Through the Dental FaceLift®, the shape of your face can be lengthened, thin lips can appear thicker, and wrinkles can be minimized. Worn down front and back teeth are restored to lengthen your face, the teeth can be angled to support your lips (if you would like fuller lips), and your bite is refined to a more natural and comfortable position. Aged yellow teeth receive a custom lighter shade to coordinate with your facial features and skin tone. You participate in the final shade and shape of your teeth to achieve the kind of look that you want. My daughter said it took 15 years off of my face!! That was the nicest thing that she has said to me in years. 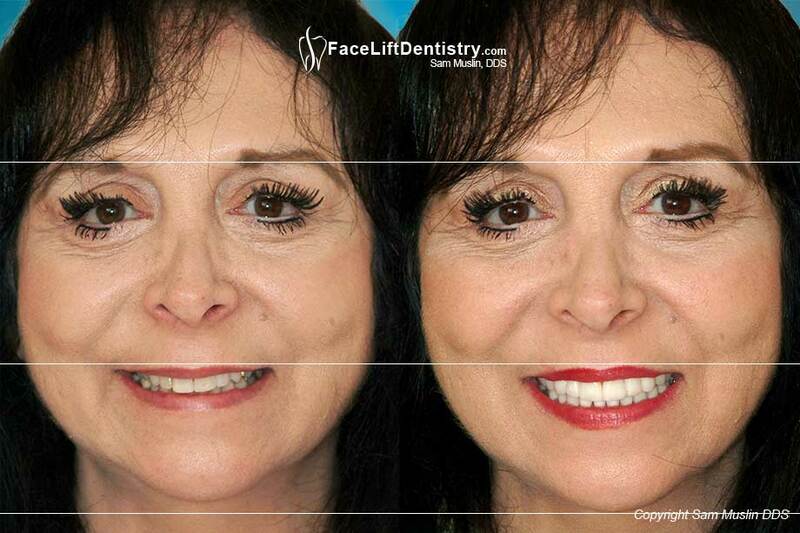 What is the Dental Face Lift®? Anti-Aging Facelift Dentistry® is a non-surgical dental treatment, which revitalizes your appearance by reversing part of the ageing process. The goal of the Dental FaceLift® is to maximize your health, your appearance, and the function and comfort of your bite by providing comprehensive dental care without unnecessarily grinding on your teeth. Many young individuals have facial deficiencies (such as a deep over bite) that could be significantly enhanced through various levels of cosmetic dental care. As we get older, the Anti-Aging Dental Face Lift ® can also revitalize our appearance by reversing years of wear and tear on our teeth. We can be restored to a point that is even better than where we were many years ago. Both a deep over bite and worn down teeth cause a person's face to be shortened, compresses their lips, increases wrinkles around their mouth, cause TMJ problems, such as headaches, and compromises their smile. Their poor bite, in turn, compromises their health, comfort and appearance. With the Dental FaceLift® your natural teeth usually do not have to be ground down, and you can generally go to work the very next day. Treatment time is about two weeks per arch with little post treatment discomfort. You may also choose to be sedated during your care. 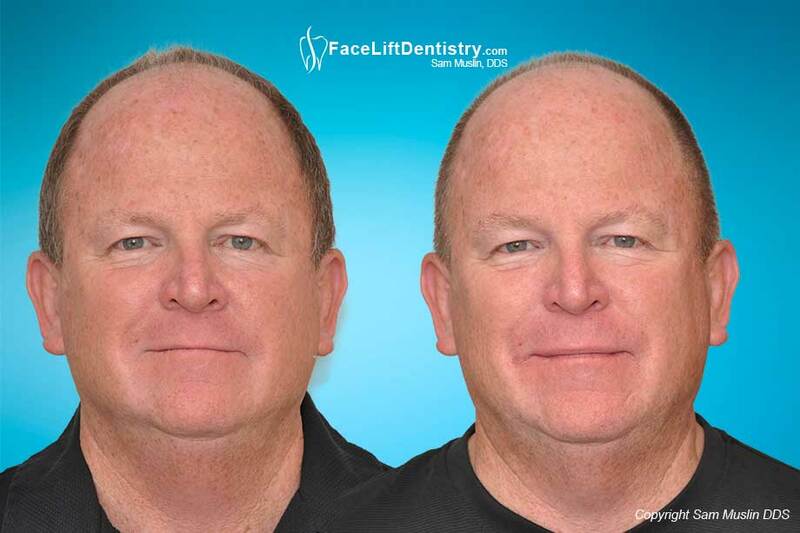 By refining the structure of your face and reincorporating the esthetic traits exhibited during your youth the Dental FaceLift® can make you look and feel naturally younger. 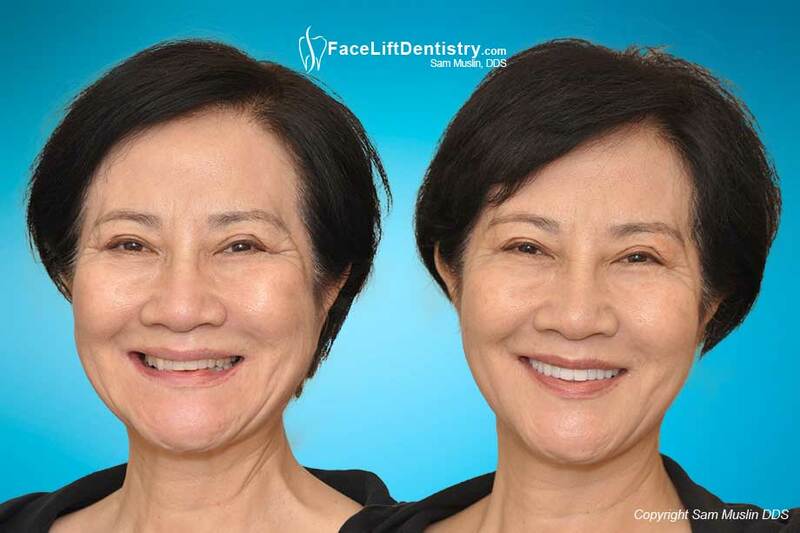 The meaning and quality of Face Lift Dentistry as told by this 68-year old patient. She has straight white teeth but they are worn down. 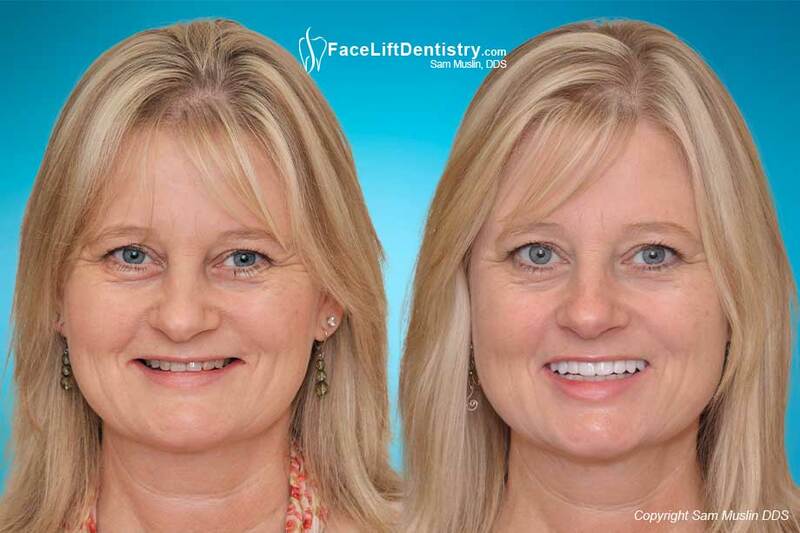 With the Face Lift Dentistry® Method, she received bite correction, a wider smile and a younger face without filing down healthy teeth. 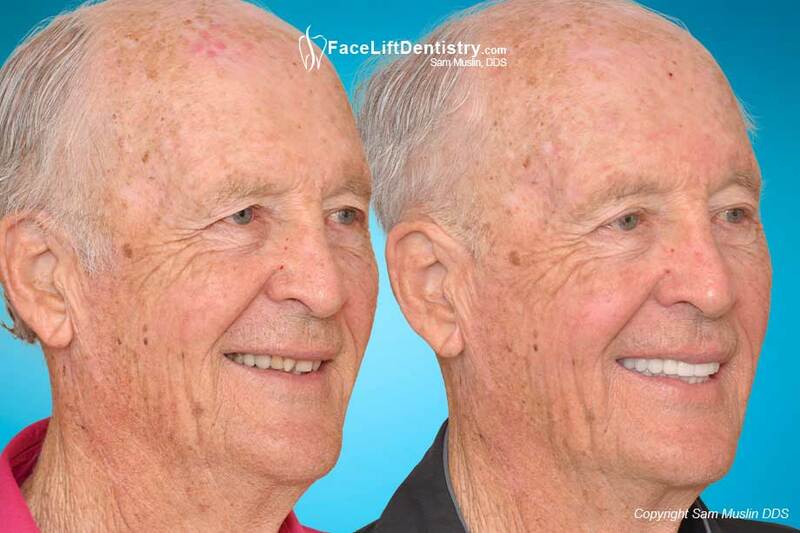 He looks younger, feels younger, facial collapse reversed, aging reversed, jaw alignment and overbite corrected with Face Lift Dentistry®. When a patient says, “I hate my profile”, gets daily headaches and has a small chin everyone except Dr. Muslin recommends jaw surgery and braces. 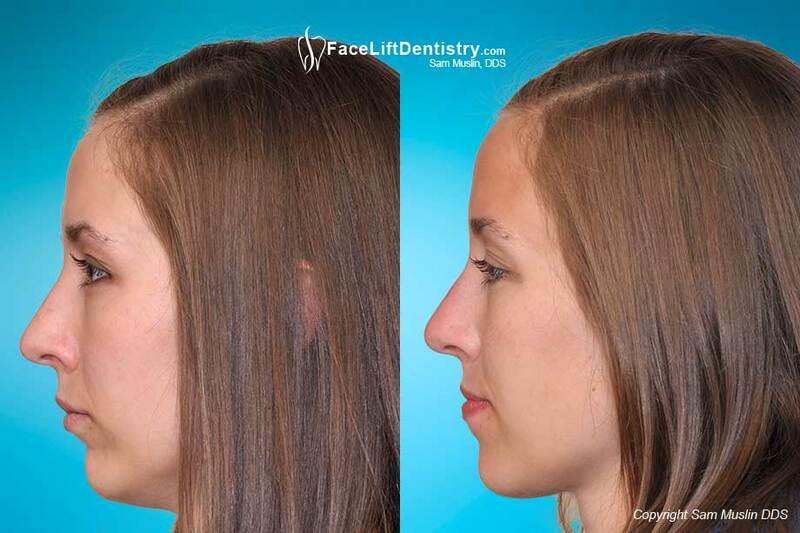 Thanks to Face Lift Dentistry® it has been over 3 years with a new profile and no headaches. Jawline, chins, bites and faces are all made to work together. When your jaw is misaligned you are physically compromised. 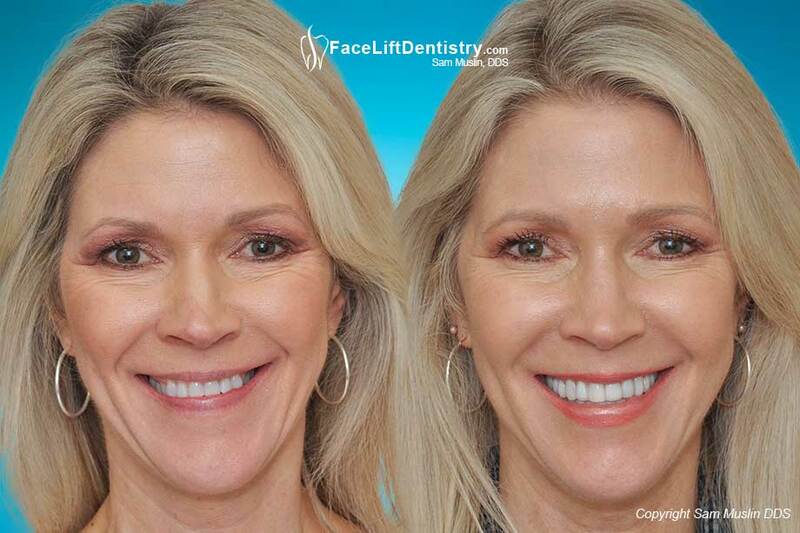 Uneven bite correction and self-esteem boosted with Face Lift Dentistry®. 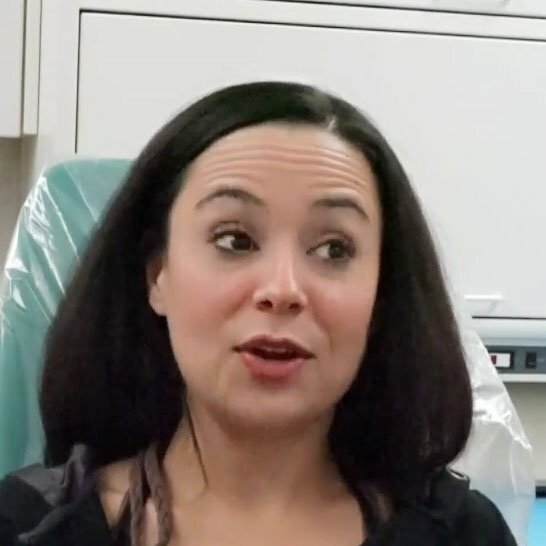 She had healthy teeth without a single filling and a celebrity dentist ground down all of her upper teeth causing enormous pain and four root canals. 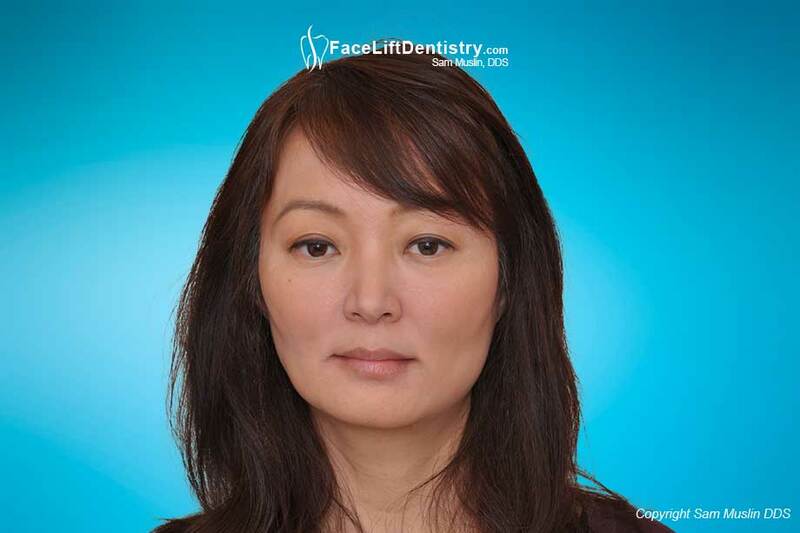 The problems were corrected with the Face Lift Dentistry® method. 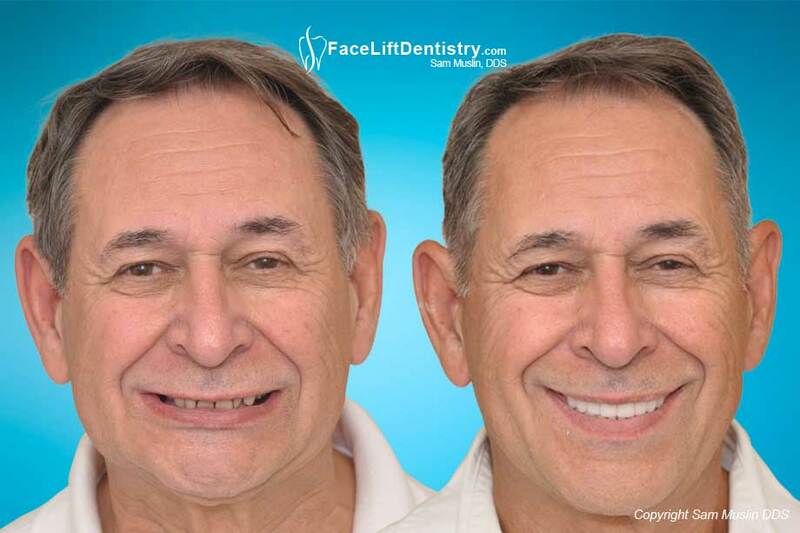 Severe headaches, deep overbite, premature aging, reversed smile, braces twice, jaw surgery was recommended, worn down teeth, misaligned jaw were all reversed with the Face Lift Dentistry® method without surgery. 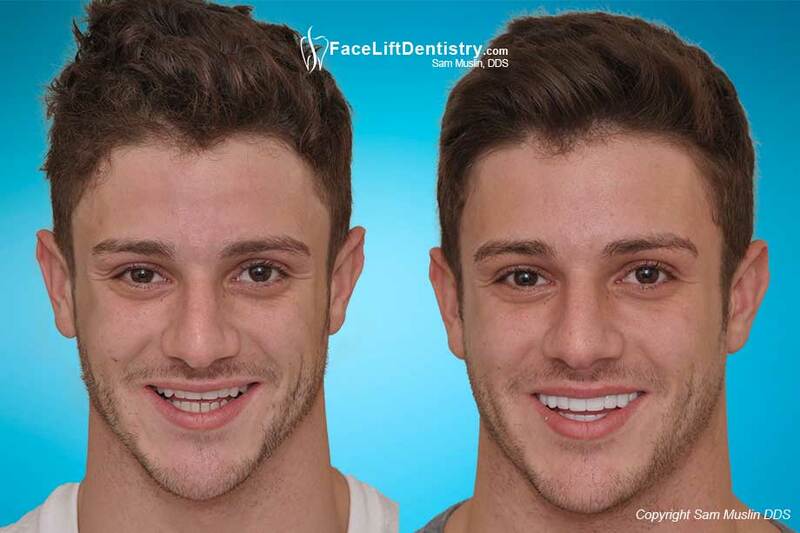 Face Lift Dentistry® is a true underbite correction method that corrects Class lll bites with porcelain VENLAY® Restorations. 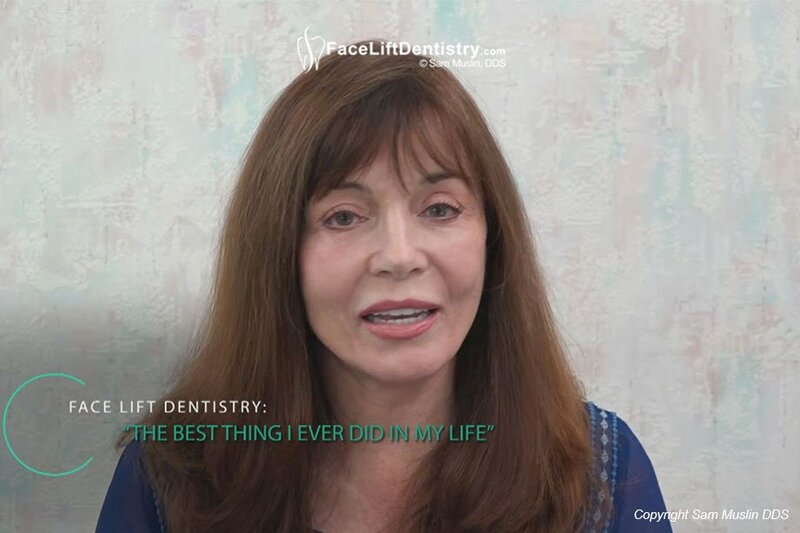 Testimonial: Face Lift Dentistry® - Porcelain Veneers Are Not The Answer! “When I first came here my face was collapsed. I work for a chain of 7 dental offices and not one of the dentists could help me. I'm very happy that I came here. I couldn't be more happy.” Read more. “I like the new shape of my face. I look like a different person. I’m happier and when I smile I like what I see.” Read more. “I did not like my smile. Veneers could not do this as my jaw needed to change, not just my teeth. My niece is a patient of Dr. Muslin and the work she had done just blew me away. 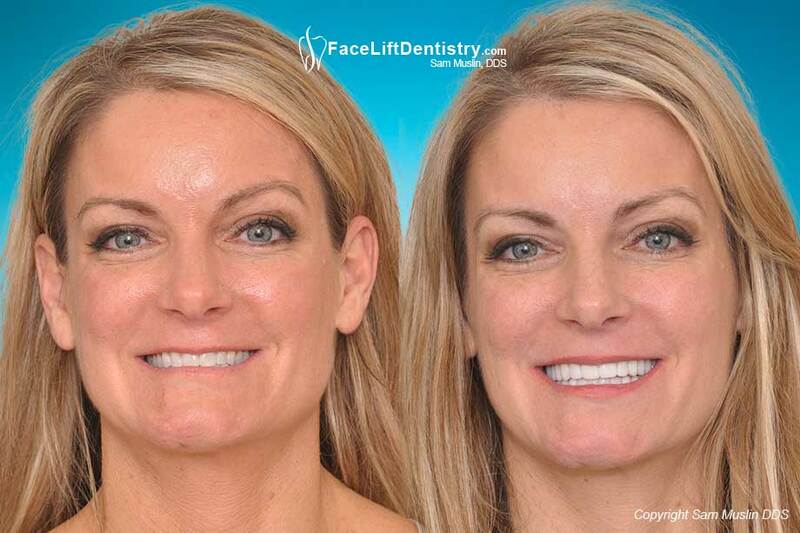 Face Lift Dentistry® gave me exactly what I need.” Read more. 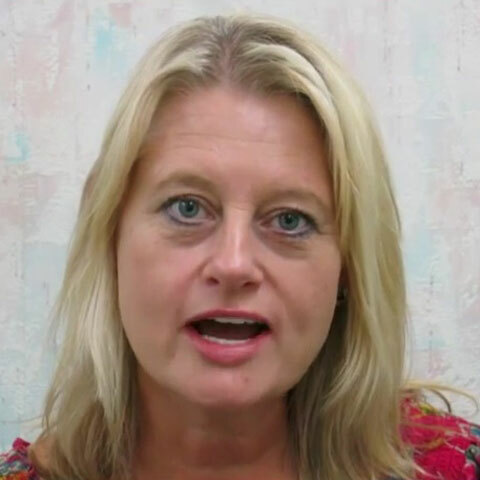 “For the first time in years I do not have headaches or TMJ pain. I feel younger and happier and get a great response with my smile wherever I go.” Read more.